Quartz is one of the hardest, most abundant minerals found in nature – only diamond, sapphire and topaz are harder. Besides beauty, the quartz in Quartz Surfacing gives it extreme strength, making Quartz Surfacing highly scratch-resistant. What are the advantages of Eagle Quartz? Eagle Quartz is a composite of natural quartz, one of the most abundant and hardest minerals on the planet, and pigments, bound with high quality polymer resins. Eagle Quartz is manufactured using the most advanced and latest technology. Eagle Quartz is a high quality solid non porous surface product that is resistant to scratches, heat, stains and water, thus providing for a virtually maintenance free surface. How does Eagle Quartz compare to other natural stones, like granite? Quartz countertops are just as strong as granite but have the added benefit of being more flexible. 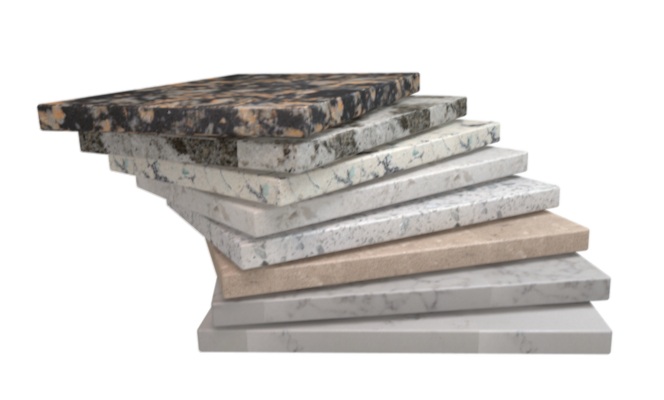 It also, offers more color consistency than granite, making it easier to pick colors from samples without having to visit a stone yard. Plus, Eagle Quartz is virtually maintenance-free – it doesn’t need to be sealed and cleaning is a cinch. Does the color pattern go all the way through the slab? Yes Eagle Quartz is solid all the way through the slab. The same beauty and color you see on the surface continues all the way through the slab allowing a wide variety of edge profiles to be possible without a change in material appearance. Do I need to apply a sealer to my Quartz surface? No. Eagle Quartz is a non-porous surface, so you will never have to apply sealer to any Eagle Quartz surface. We recommend using cleaning products between pH 5-8, as products outside this range may damage the surface. Avoid exposing your surface to chemicals with pH levels outside this range, such as oven grill cleaners, floor strippers, toilet bowl cleaners, oil soaps, tarnish removers, furniture cleaners, drain products, etc. Should your surface accidentally be exposed to any potentially damaging products, rinse immediately with water to neutralize the effect. Does Eagle Quartz include a warranty? Eagle Quartz backs all installed countertop projects with (an industry-leading) 10-Year Limited Warranty. Eagle Quartz’s warranty covers structural manufacturing defects. Can I use for walls and floors in different areas in my home? Eagle Quartz has a carefully designed color palette of products that can be used in a variety of domestic and commercial applications for floors and walls. Eagle Quartz is suitable for many types of indoor flooring applications. Eagle Quartz is also an excellent choice for a wide variety of indoor wall applications including backsplashes, tub surrounds, shower walls, and other interior wall surface. Eagle Quartz is not recommended for exterior use, as exposure to direct sunlight for prolonged periods can result in color changes, fading and/or warping. Although Eagle Quartz is extremely scratch resistant, it is not scratch proof. It is not recommended to cut or chop directly on your countertop. It is recommended to always use a cutting board.